I’m not really one for favourites, but I do have a soft spot for the neutron; and after all, it would be a shame to leave it out, wouldn’t it? There are two things I really like about neutrons, and these in turn will lead me on to talking about two of my favourite experiments. The first thing I like is that you can bottle them: you can put them in a container and they just stay there, until either you let them out or they decay (which they do in about 15 minutes). Well, OK, you can also bottle protons and electrons, but your bottle has to be made of magnetic fields, and these have to be shaped very carefully to stop the particles escaping. With neutrons, you need just two things: a container lined with a suitable material (beryllium will do) and a way of slowing your neutrons down a bit. A beam of neutrons at room temperature. The speeds of particles can be expressed in various ways. In particle accelerators it is common to quote the kinetic energy of the particle (usually in giga-electron-volts or GeV); this is related to the speed, although the actual relationship is quite complicated because particles in accelerators travel at near-light speeds, where special relativity has to be taken into account. But you can also describe them in terms of temperature. The temperature of a gas, for instance, is related to the average speed of its molecules (or, to be more precise, it’s actually the squares of the speeds that are averaged) and since a collection of particles behaves something like a gas, the temperature analogy can be useful here too. For instance, we speak of “thermal” neutrons as free neutrons that have acquired, by collision, the same kinetic energy as the atoms of the medium they are travelling in, when that medium is the moderator in a nuclear reactor – so, rather hot, by human standards. (They have a temperature of the order of 1000 K, and speeds of a few km/s). But you can slow them down so that they become cold, then very cold , and finally ultra-cold neutrons (UCN). Ultra-cold neutrons are travelling at just a few metres per second – you could keep abreast of them at a run. (Unfortunately, as visitors to Sellafield are told by their guide, you couldn’t keep abreast of the neutrons from an explosion in a nuclear fuel reprocessing plant, but that is another story). 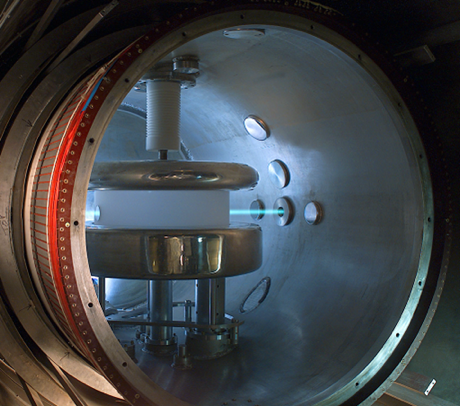 Storing neutrons in this way is a tremendous advantage if you are doing an experiment into the nature of the neutron, especially if your experiment takes a long time. When the bottling of neutrons was first achieved, in the 1970s, it provided a huge boost to an experiment that had already been running, off and on, for 20 years by then, and is still running, in a later incarnation, today. It is the experiment to measure theelectric dipole moment (EDM) of the neutron, and it first came about as a result of a bet between Richard Feynman and fellow-US physicist Norman Ramsey, over the question of parity conservation. Parity conservation is another story entirely; suffice it to say that in 1950 it was thought that the violation of parity conservation would be accompanied by an asymmetry in the charge inside the neutron. Now the neutron is an electrically neutral particle, hence its name, but it is thought to have charged constituents (see Lily’s blog on quarks), and therefore it is possible that the charge is not distributed uniformly, which would produce a non-zero EDM. And in fact a non-zero EDM would help us to understand one of the great mysteries of the universe, which is why all the matter and antimatter that came into being at the Big Bang didn’t just annihilate each other, but in fact left a small residue of matter, enough to make all the stars, planets, and us. So in other words it’s quite important. (See Mark’s blog on the muon for more details). The EDM experiment requires us to observe our neutrons over as long a time as possible, so bottling them is obviously beneficial. The neutron EDM experiment is still going on today. No-one has yet found a non-zero value for this quantity; what the experiment has done, over the years, is to drive down the uncertainties by several orders of magnitude. In other words, what the experiments have been able to show is that there is a high probability that the EDM lies somewhere between two limiting values, and those limiting values have been getting closer and closer to each other all the time. The results of all quantitative experiments are expressed in this way: a central value is given, together with a measure of how far away from that value the true value is likely to be. This measure is sometimes called the error, but I think that gives the wrong impression – it makes it look like we are saying we have made a mistake, when we haven’t. It is better to call it the uncertainty. And one of the things you learn when you study science is that there is always an uncertainty – you can’t eliminate it entirely. (This is nothing to do with Heisenberg’s Uncertainty Principle, by the way, which links together uncertainties in various pairs of quantities). This brings me on to the second experiment I want to tell you about. Unlike the EDM experiment, it’s not one I have been involved in, or even know very much about. It’s the very existence of the experiment that appeals to me. It’s an experiment to measure the electric charge of the neutron. Hang on a minute, I hear you say. Didn’t you just tell us, a couple of paragraphs back, that the neutron is electrically neutral, in other words its charge is zero? So why is someone trying to measure it? Well, OK, we “know” that the neutron is neutral because our current best theory of the neutron – the Standard Model of particle physics – predicts that its charge will be zero. But like all predictions of theory, that one has to be tested in the laboratory; so far, the results of experiment are consistent with the prediction, but no-one will ever be able to confirm that it is indeed precisely zero – only that it is zero plus or minus the uncertainty, which, last time I looked, was roughly 0.000000000000000000001 times the charge on the electron. Now that’s small, but it is not zero, and however much we refine the experiment, it will never be zero. So it looks like the knowledge we have of the universe falls into two categories: theoretical knowledge, which offers precise, clean-cut answers which are, in a sense, “at one remove” from reality; and experimental knowledge, which gives us first-hand answers that tend to be messy and probabilistic. Quite often, when scientists say they know something, it is the former kind of knowledge they are talking about. So, the next time you hear a scientist saying that we “know” that, say, dark matter exists, it will probably just mean that a theory in which dark matter exists is consistent with the results of experiment, not that someone has actually detected any. This entry was posted in NUCLEAR PHYSICS and tagged neutrons. Bookmark the permalink.